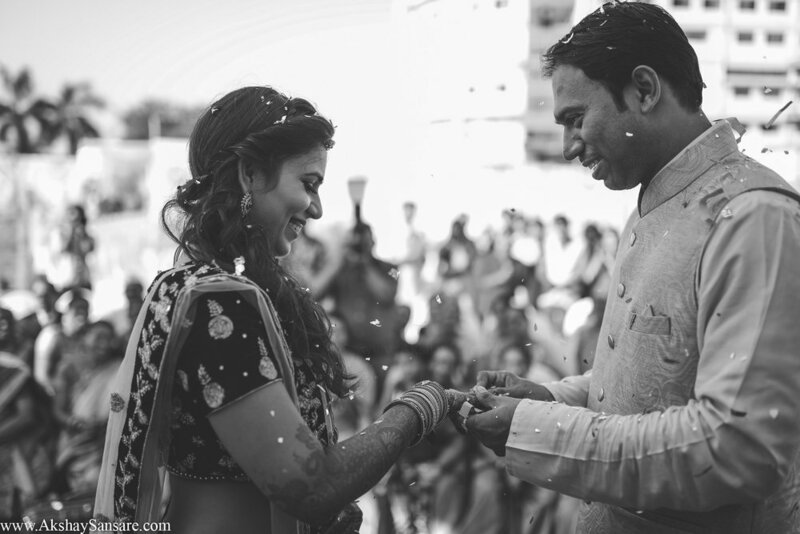 HOME WEDDING PHOTOGRAPHY FILMS PRE-WEDDING ABOUT BLOG CONTACT Amit x Mitali Blogs Terms & Conditions FAQ Album . When we proceeded to capture their pre-wedding at the peak of Sahyadri ranges , these two personalities took us by the surprise & in a good way I must say. On the contrary to their profession these two were completely opposite. Prajakta was just this balloon of happiness waiting to be burst, which kept us on our toes throughout the day and with Bhushan there to complement each one of her expressions with his composure, it was picture perfect. These attorneys practised law by day and wove stories of love after. On the outskirts of Panvel, Kale & Mhatre pariwar welcomed us at Karnala Sports Academy. With over 1000 guests to bless the couple, it was a lavish wedding affair. Hues of orange and pink did their magic with couple as sun settled down the horizon. Glistening stars rose and applauded as Prajakta & Bhushan took the pheras. Fireworks roared as there was a tug of war while wearing warmalas. Prajakta was ecstatic and why wouldn't she. It was her own fairy-tale wedding for which she and her bridesmaid had done months of planning. For which, in fact she had personally gone to paithan to select her jewellery. Maybe this driven force was the reason, we couldn't find Bhushan looking anywhere but at Prajakta. He'd would just look and admire what he has gotten himself into. Prajakta & Bhushan were in love. Never ending smile on both of their faces let us enough to know their story. Weddings no more get tiring for us, in fact with another day at work and with another two, we got to know little more about love.